If you're looking for a great (and cheap!) hotel in Montreal, CheapTickets is the best place to find them. 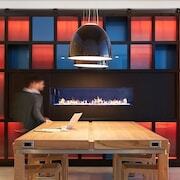 We offer deals on the best 556 hotels throughout Montreal. No matter what you're looking for, we have options for you. Grab great rates on the 281 affordable 3-star hotels that are easy on the wallet without sacrificing comfort. Looking for more luxury? Try one of the 101, 4-star hotel accommodations in Montreal. No matter your budget needs, we've pulled out all the stops to make sure you have plenty of vacation options. Maybe you prefer to search for your hotel deals based on what each hotel offers? For example, let's say you just want to find a hotel or resort that has a pool to cool off in after a long day exploring Montreal. Scroll down to choose from the 118 hotels in Montreal that has a pool for guests. Or search for deals on Montreal hotels offering free wifi or breakfast, non-smoking rooms, and more! CheapTickets is here to be your personal travel agent for your next trip to Montreal. Get booking today! What hotels in Montreal offer free wifi access? Are there deals on Montreal hotels offering free breakfast? Yes! The only thing better than finding a great deal on a cheap hotel in Montreal is finding one that offers free breakfast. Grab some eggs, a waffle, or some healthy oatmeal before a day full of exploring Montreal and all that it has to offer. Below are just some of the many hotels that offer free breakfast in Montreal. Hôtels Gouverneur Montréal is a 3.50 star rated hotel property in Montreal that offers free breakfast. 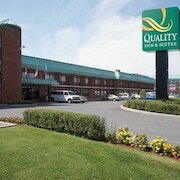 Hôtel Brossard is a 3.00 star rated hotel property in Montreal that offers free breakfast. Hotel Omni Mont-Royal is a 4.50 star rated hotel property in Montreal that offers free breakfast. 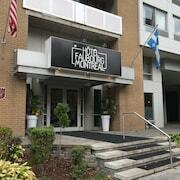 LHotel Montreal is a 4.00 star rated hotel property in Montreal that offers free breakfast. What about deals on pet-friendly hotels in Montreal? Montreal is a great place to get outside and explore with your pets in tow so don't leave your furry friends behind. Below you'll find great deals on hotels in Montreal that allow pets. Don't forget to bring plenty of treats! Chateau Versailles is a popular, pet-friendly, 3.50 star hotel in Montreal. 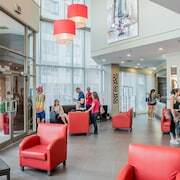 Travelodge Hotel by Wyndham Montreal Centre is a popular, pet-friendly, 3.00 star hotel in Montreal. Embassy Suites Montréal by Hilton is a popular, pet-friendly, 3.50 star hotel in Montreal. Hotel Faubourg Montreal Downtown is a popular, pet-friendly, 3.00 star hotel in Montreal. Any good rates on Montreal hotels with restaurants? Absolutely. Don't want to deal with planning our all your meals on your trip to Montreal? We don't blame you. Keep the hangry away by staying in one of the 104 hotels that have restaurants. With a room at one of these spots, all it takes to get a good meal is hopping in the elevator. Check out some of the most popular hotels in Montreal that have restaurants below. Book Hotel Bonaventure MontrealHotel Bonaventure Montreal is a 4.00 star hotel and has one or more restaurant options. Book Delta Hotels by Marriott MontrealDelta Hotels by Marriott Montreal is a 4.00 star hotel and has one or more restaurant options. Book Le Saint SulpiceLe Saint Sulpice is a 4.00 star hotel and has one or more restaurant options. 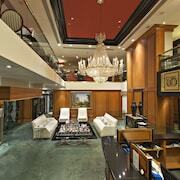 Book Hotel NelliganHotel Nelligan is a 4.00 star hotel and has one or more restaurant options. What are the cheapest hotels in Montreal with pools? What's better after a long day exploring Montreal then a relaxing dip in a pool? 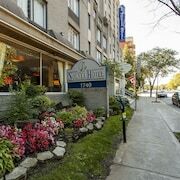 Finding the Montreal hotel you need for a bargain! 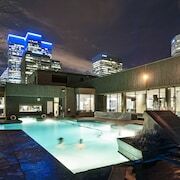 Cool off and unwind at one of our 118 Montreal hotels with a pool. Browse some of the top deals on these hotels and resorts with pools in Montreal below, but be warned: You may not want to check out! Le Square Phillips Hotel And Suites has a pool and a 3.00 star rating. Le St-Martin Hôtel Particulier Montréal has a pool and a 4.00 star rating. Le Westin Montréal has a pool and a 4.00 star rating. Residence Inn by Marriott Montreal Downtown has a pool and a 3.00 star rating. What hotels in Montreal offer parking for guests? Once you've made your way to Montreal, the last thing you want to deal with is finding parking close to your hotel. Avoid the hassle of parking around the block and carrying your luggage all the way to the lobby by booking one of our hotels with parking. Check out deals on some of the 203 hotels in Montreal that offer parking for guests. Auberge Le Pomerol This hotel has a 3.00-star rating. Hotel Le Crystal Montreal This hotel has a 4.50-star rating. Novotel Montreal Aeroport This hotel has a 4.00-star rating. La Tour Belvedere Apartment Hotel This hotel has a 2.50-star rating. Do Montreal hotels offer 24-hour concierge services? When you're on vacation, things don't always go according to plan. Travel with peace of mind when you book one of our 90 hotels in Montreal with 24-hour concierge service. That way you know help is always phone call or elevator ride away. Try Le Nouvel Hotel & Spa. It's a 4.00 star rated hotel in Montreal that offers concierge services 24 hours a day. Try Hotel Chez Swann. It's a 4.00 star rated hotel in Montreal that offers concierge services 24 hours a day. Try Hotel Place d'Armes. It's a 4.00 star rated hotel in Montreal that offers concierge services 24 hours a day. 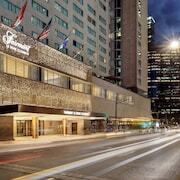 Try Courtyard by Marriott Montreal Downtown. It's a 3.50 star rated hotel in Montreal that offers concierge services 24 hours a day. What about low rates on non-smoking hotels in Montreal? Hotel Place d'Armes This hotel has a 4.00-star rating. Montreal Marriott Chateau Champlain This hotel has a 4.00-star rating. Hotel Le Dauphin Montreal Downtown This hotel has a 3.00-star rating. Auberge du Vieux-Port This hotel has a 4.00-star rating. What are the cheapest Montreal 3-star hotel deals? Our 3-star hotels bring you quality accommodations at a lower price point for the perfect, budget-friendly vacation in Montreal. With 281 3-star hotels throughout Montreal to choose from, you still have options. Browse our selection below. Courtyard by Marriott Montreal Downtown. Located in Downtown Montreal, this hotel is within a 10-minute walk of St. Patrick's Basilica and Christ Church Cathedral. Notre Dame Basilica and University of Quebec-Montreal are also within 15 minutes. Hotel Le Cantlie Suites. Overlooking Mount Royal Park, this elegant 28-story hotel is within walking distance of McGill University, Montréal's downtown business district, and Peel metro station. The Bell Centre is 3 blocks away. Le Square Phillips Hotel And Suites. Located in Downtown Montreal, this hotel is steps from Phillips Square and Christ Church Cathedral. Notre Dame Basilica and Bell Centre are also within 15 minutes. L Appartement Hotel. 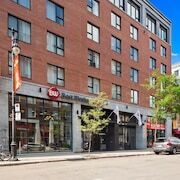 Located in Downtown Montreal, this eco-friendly aparthotel is within a 10-minute walk of McGill University, Christ Church Cathedral, and Percival Molson Memorial Stadium. Notre Dame Basilica and University of Quebec-Montreal are also within 1 mi (2 km). What are the best deals on 4-Star Hotels in Montreal? Montreal is full of hotels and it can be hard to narrow down where you really want to stay. Luckily, we've done that hard work for you be narrowing you from 556 hotels throughout Montreal, to the 101 4-star hotels in Montreal. Our 4-star hotels in Montreal are exactly what you need for your next family trip, romantic weekend, or solo getaway. Check out our most popular deals below. Hotel Bonaventure Montreal: This penthouse-style hotel comprises the top two floors of the 17-story Place Bonaventure business and shopping complex and is linked by elevator to Montréal's underground city. Le Centre Sheraton Montreal Hotel: This 36-story centrally located hotel, is 1 block from Ste Catherine Street shopping and the Bell Centre. Upscale restaurants and nightlife are also within easy walking distance. Le St-Martin Hôtel Particulier Montréal: Located in Downtown Montreal, this eco-friendly hotel is within a 10-minute walk of Les Cours Mont-Royal and Christ Church Cathedral. Bell Centre and Percival Molson Memorial Stadium are also within 1 mi (2 km). Loews Hotel Vogue: Located in a vibrant area of downtown galleries and boutiques, the Montreal hotel is 1 block from rue Ste-Catherine, 2 blocks from the Bell Centre, and 3 blocks from the Museum of Fine Arts. What are the best activities to do in Montreal? Pointe-à-Callière Museum Tickets: Starting at just $17 per person. Guided Sightseeing Cruise: Starting at just $20 per person. Montreal Grevin Wax Museum Tickets: Starting at just $18 per person. Old Montreal Ghosts & Spirits Walking Tour: Starting at just $20 per person. What are the most popular attractions in Montreal? People travel to Montreal from all around to witness the incredible sights and attractions. With 4 sights to see during your stay, you're sure to have a busy trip in Montreal. Below, we've listed some of our favorites. Perfect hotel, beautiful, great staff, wonderful rooms. One of the best hotels I have ever stayed at. The hotel was clean and conveniently located for our stay. Great location and world -class facilities, but above all, outstanding service and welcoming staff.